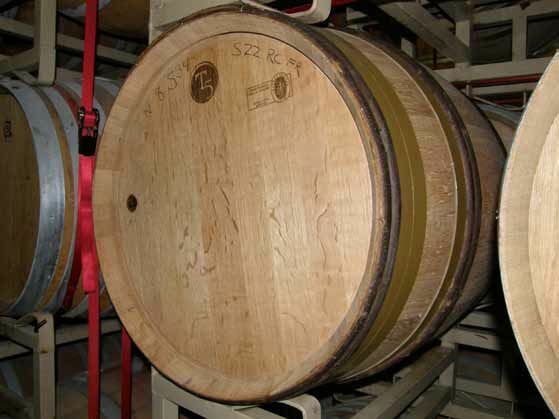 French oak barrels are a critical part of successful Pinot Noir vinification because Pinot Noir loves oak. It is a match made in heaven that gives Pinot Noir structural tannins, contributes texture, adds flavor and builds depth. It even contributes polyphenols that give wine its potential health benefits. That said, the marriage of Pinot Noir and oak is a delicate and contentious relationship. Oak aging is as likely to bring a Pinot Noir down than to elevate it. It is an interaction that challenges the winemaker’s touch. Barrel aging Pinot Noir in French oak barrels adds literally hundreds of aromatic and flavor compounds to the wine. The most commonly observed are lactones (coconut, spice and herbaceousness), vanillin (vanilla), guaiacol (char-like smoky aroma and spice), eugenol (clove, nutmeg and cinnamon), furfural (butterscotch, caramel and almond), ellagitannins (astringent taste), and sotolone (maple syrup, caramel, toasted nuts and soy sauce). The combination of more than one of these can produce very complex aroma and flavor perceptions including ash, mushroom, leather, dill, mown hay, grass, tobacco, cedar, sawdust, pine, tar, resin, bourbon, cotton candy, molasses, honey, toffee, marshmallow, butter, popcorn, baked bread, cookie dough, peanut butter, graham cracker, coffee, mocha, barbecue, charcoal, bacon, sweet smoke, burnt sugar, licorice and anise. I find that oak, particularly new oak, can be overbearing in Pinot Noir, and as a result, oak is the first or most prominent aromatic or flavor feature met with when tasting a Pinot Noir wine. Because aggressive oak is not a desirable quality in premium Pinot Noir, I downgrade the wine, but some reviewers do not. Everyone’s tolerance for oak varies and this accounts for the disparity among reviewers’ attitudes toward oak enhancement of Pinot Noir. There are pinotphiles who relish lavishly oaked Pinot Noir but I am not one of them. I do not want to think of “oak” when tasting Pinot Noir. You have been forewarned, but I will try to describe the oak treatment of wines in an unbiased tenor so the reader can decide if the wine is to their taste.